Throughout the oil and gas industry, companies are working hard to address knowledge and experience gaps, particularly within technical and operational areas. Land Operations is a key function within upstream operations that is experiencing significant challenges resulting from these same age and experience gaps. As North American shale exploration and extraction continues to grow, the Land Operations function has become an integral part of business development, asset acquisition and asset management. Now more than ever, it is essential for onshore-focused organizations to ensure effective knowledge transfer from retiring and experienced employees to the influx of early career talent. In the first phase, the Enite project team will document all processes and policies through a series of staff interviews to capture the current state. During these interviews, the team will keep track of current risks that have potential project impact to make sure the project stays on time and in scope. With our process improvement expertise, clients can expect thoroughly vetted process flowcharts documenting Land Operations and related function responsibilities, touch points and key tools. The next step is to identify “to-be” processes, policies and procedures. The team will work with leadership to capture the ideal future state of the operation. 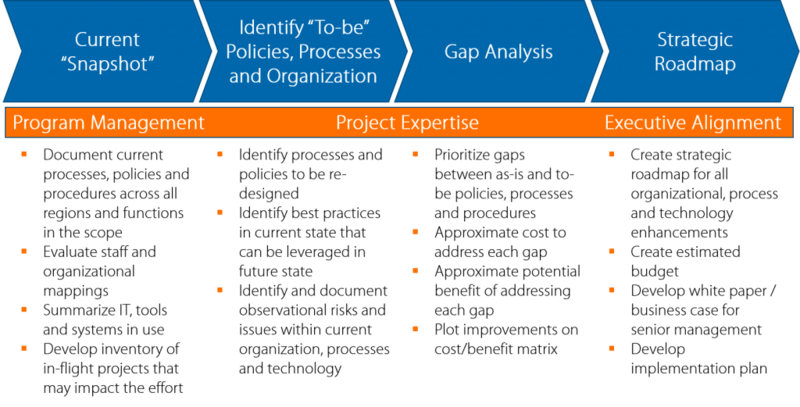 From this point, the project team will identify and document best practices, project risks, observations of improvement opportunities, and analyze issues associated with current processes, organizational structure and technologies. In the final phases, an analysis of the gap between the current state and proposed future state is conducted. During this phase the Enite project team will evaluate, prioritize, and communicate the critical next steps before implementation. Before implementation begins, the team facilitates leadership alignment on the strategic direction of the project and implementation plan. During implementation, the team will prioritize improvement opportunities and identified options for resolution. Implementation will include development of all identified deliverables, along with a training and change management plan for the organization.